When I first decided to make the switch to organic, natural, and safe skin care and body care products, one of the first brands I tried was Yes To products because they were easily available at my local retailers, affordable and didn't have any of the harmful ingredients that I was trying to avoid! They then proved to be one of my favorite products and companies! Founded in 2006, Yes To, Inc. is a global leader in natural skin and hair care, with awesome and affordable products made with fruits, veggies, and a smile! Yes To’s award-winning formulations are over 95% natural, have proven results, and are free of parabens, petroleum, and SLS. We offer six unique collections including products for face, body, hair, lips, and even babies...to allow people to create their own natural ‘recipe’ that works for them. We are a fun-loving, wine-drinking, yoga-doing, active-life-living bunch of folks in San Francisco who a) create affordable natural products that really work b) give back by planting school gardens for kids to help teach them about healthy living and nutrition, and c) have a pretty awesome time doing it. So join us, and say YES to naturally good products...unnaturally good results! Right now it's all about GRAPEFRUIT! Yes To Grapefruit, the newest family from Yes To which has just arrived in shops across the country, stars formulations which blend powerful fruit acids with ingredients that help to reduce hyper-pigmentation, correct skin damage, and enhance radiance. Use the entire collection to help correct and repair sun damage and age spots (who doesn't love that?). Grapefruit extract assists in warding off free radicals and minimizing skin discoloration and is rich in anti-oxidants such as Vitamin C and Lycopene to help increase skin radiance and even skin tone, promoting healthy, smoother and softer looking skin. Also rich in citrus flavanoids, which contain potent soothing agents. Yes To is sold at your local drug store so you can get a gourmet spa experience at a price point that doesn't bust the wallet. So much to love! The products in the line are: Facial towelettes, daily facial scrub, dark circle correcting eye cream, dark spot correcting serum, even skin tone moisturizer, exfoliating body wash, spot correcting body creme, everything to manage your daily beauty regime. 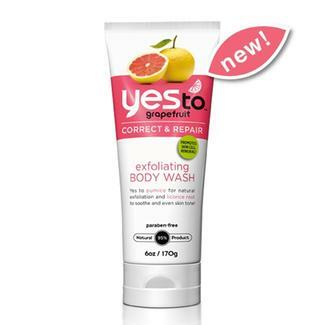 My favorite from the new Yes To Grapefruit line is the Exfoliating Body Wash! Yes to Grapefruit Exfoliating Body Wash cleanses, exfoliates, and adds an extra dose of radiance to your daily shower. Pumice naturally exfoliates skin, while the Vitamin C and Citric Acid found in Grapefruit facilitate healthy skin renewal. Your skin will be smoother and more even-toned – and best of all, the delicious scent takes you to a tropical locale (let’s imagine Tahiti). Get ready to glow, girl! I love that it is 95% natural, paraben-free and SMELLS SO GOOD! I also REALLY LOVE their Lip Butter set! A beautiful smile will brighten your face, but what brightens a beautiful smile? Your lips - soft, smooth and shining! 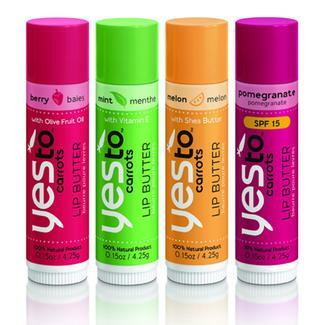 Yes To Carrots Lip Butters are formulated with certified organic fruits and veggies to condition, invigorate, and revitalize your lips, moisturizing to keep them the smoothest and softest they can be. With this purchase, you get all 4 flavors: berry, pomegrante, melon and mint. Now you'll never be without smooth, soft lips! These lip balms feature All Natural Ingredients, are Paraben, Petroleum & Phthalate Free and smell so good and feel so good! This is now my lip balm of choice and I always make sure to carry one at all times! 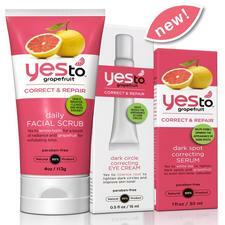 So if you are ready to make the switch to natural and SAFE body care products but don't want to break the bank, then make the switch to Yes To products and make sure to try out their new Yes to Grapefruit products! Buy It: You can purchase all Yes To products at a local retailer near you or online from the Yes To website.